Do you have speech anxiety? Only a small percentage of the population suffers from true glossophobia, or fear of public speaking. Even just the thought of speaking to a group of people would induce intense anxiety to glossophobics so much so that they may avoid public events altogether. For the rest of us who are not actually afflicted with the disorder, the butterflies fluttering inside our stomachs are still a bother. We may think we’re going to pull through but it’s not a fun activity to say the least. One of the more common effects of speech anxiety is the frequent pauses accompanied by uhmmm or uhhhh. In linguistics, they are called fillers. For a friendly conversation, fillers are okay. But if you are speaking to a group, especially presenting a keynote to your superiors, then it becomes dangerous, even fatal, to the points you are discussing. London Speaker Bureau, a UK-based speaker agency, created an infographic addressing just that. 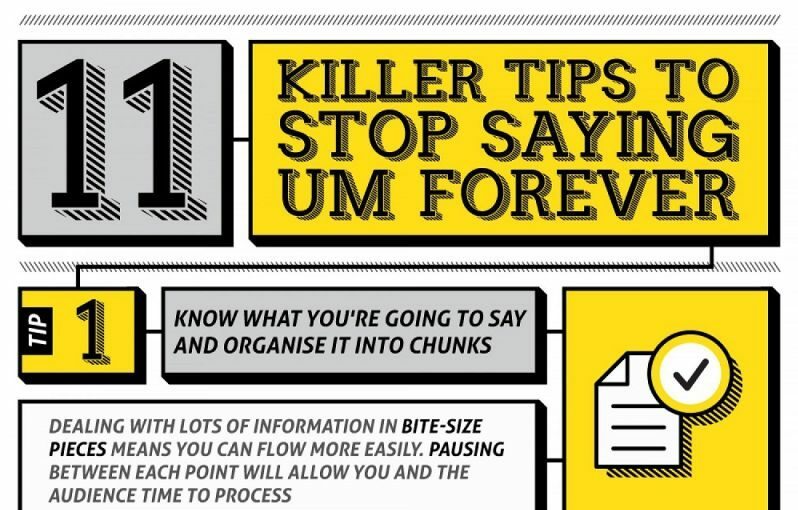 Here are some tips to improve your presentation skills by reducing ums or eliminating fillers. They are a natural part of human speech. Almost all languages have these kinds of words to indicate that the speaker paused to think but is not finished with the statement yet. Generally, filler words has a negative effect on credibility. However, a study found out that it has a positive effect on the honesty of the speaker. Australian scholars studied the speech pattern of a convicted man and found that he used more filler words when he was being honest while minimal to none when lying. He had planned out what to lie in advance. Most listeners filter out filler words. If your content is engaging enough people would gloss over your filler words and focus on your content. But if not, they would focus on your style and delivery. They sometimes aid comprehension. While filler words have generally negative impact in the understanding of the listener, they may have positive effect on comprehension. Filler words prompt listeners to look for new information than for old. We often use filler words when approaching unfamiliar vocabulary or content, listeners will automatically prepare themselves for new information to be presented, therefore positively affecting their comprehension. Context is important. In informal situations such as conversations with friends, or events calling for extemporaneous speeches, filler words are okay. However, you need to minimize them during formal situations such as job interviews, formal speeches, and yes, business presentations. How do you deal with filler words? Comment below!